We have teamed up with Freeride World Tour to offer one lucky winner and a friend the chance to go to Vallnord in Andorra to watch the third stop of the Freeride World Tour. Uniquely, Faction’s design research determined that women don’t require softer skis made of cheaper materials… who’d have thought it eh? The choice of ski should be according to weight and ability, not gender. The X Series has been ridden by Faction’s all-star women’s team to claim gold medals and podiums at the Olympics, FIS World Cups and the X-Games. Every model in the X series is the exact same shape, construction, flex and material as the main range – but with alternative graphic options. And refreshingly, they don’t actually look like tampon boxes. While the Rossignol Spicy, Volkl Confession and Roxy Dreamcatcher skis leave us cringing at the names, Faction’s Prodigy and Dictator range put fire the in bellies of their users, and that’s what we like to see. The Prodigy 1.0x has been the most successful ski on the women’s slopestyle competition scene in 2018 & 2019. Sarah Hoefflin and Mathilde Gremaud swept gold & silver medals in South Korea last year, and the wins have not stopped since. At the X-Games in Aspen in January, Kelly Sildaru scored an unprecedented 99, and was the first athlete to ever have won three medals in one single X-Games. She insists that it’s important to sport a feminine topsheet. But the fact is, some of the women prefer a more neutral style, reflecting a diversity of opinion among skiers everywhere. Here she is smashing her slopestyle run at the X games this year. Alex Hoye, Founder & CEO at Faction said: "We have thought about this a lot and came to the clear conclusion to offer a choice. We’ve had great feedback on our X Series graphics which unapologetically offer strong feminine styles, but not all women want the same thing and that’s great. For those who don’t, the main range is there. Either way, creating the X-Series gives us space to celebrate and be inspired by the Faction women who are changing the face of freeskiing every day they hit the mountain. " 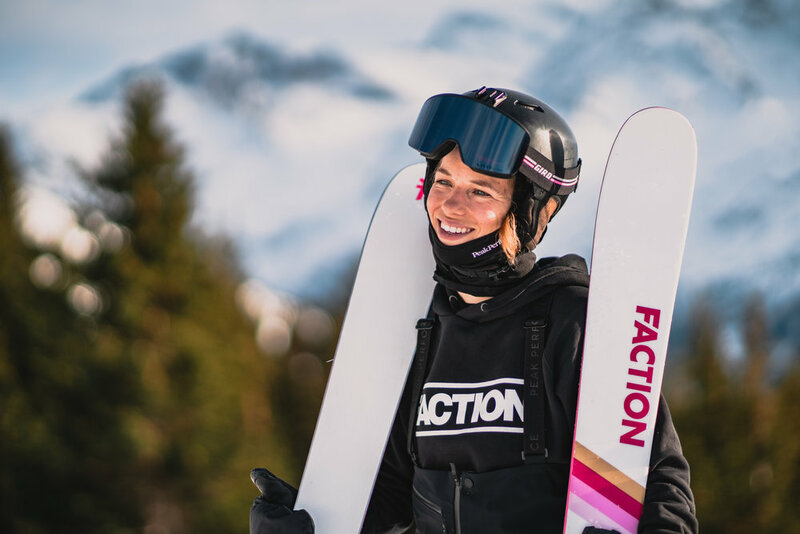 Faction skis have been put through their paces on the Freeride World Tour this year by Swiss skier Elizabeth Gerritzen who is currently sitting in fourth place overall, having reached the podium several times already on the tour. At Line-S we were lucky enough to test the Dictator range recently and boy were we impressed. You can read our review of the 2.0X here. So the designs have had mixed reviews but at Line-S HQ we are glad to hear that Faction focus just as much on the construction, allowing women to push the boundaries of their abilities and show exactly what they’re made of. Faction is leading the way in bringing the best out of female skiers, showing just why you shouldn’t judge a ski by its topsheet.